This John Hardy cord bracelet is part of the Classic Chain collection. 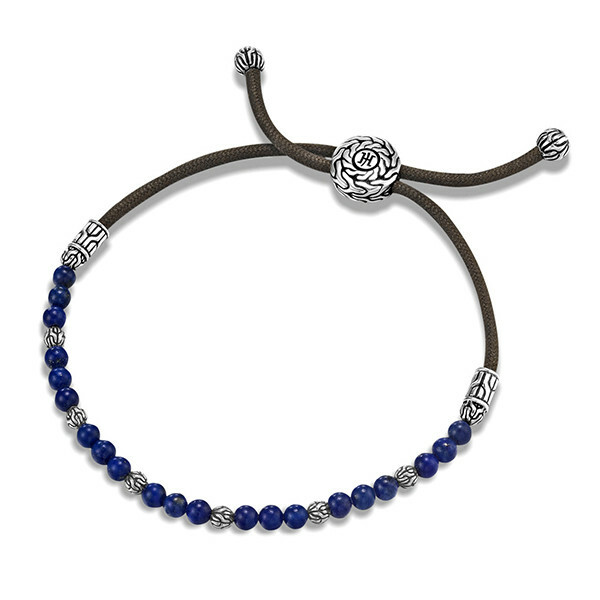 A black mokuba cord captures beautiful blue lapis lazuli and sterling silver beads. Sterling silver is also used to cap the ends of the bracelet and to create the station that holds the two ends together. The classic chain motif is carved into each sterling silver piece for greater dimension. This stylish John Hardy bracelet can be worn every day! NOTE: Color may vary. Blue Lapis Lazuli, Black Makuba Cord. NOTE: Color may vary.